Yeah, so much mobility, as I said last week. Tuck has really gotten the hang of crawling, though it isn’t a pretty, smooth action yet. But he is a madman, moving all over the place so fast we can’t even figure out how he’s doing it. We lowered the crib mattress last week because he suddenly figured out how to sit up/try to climb over the edge. This morning he’d pulled a blanket rack over to himself and gotten a blanket into his crib (that’s been moved). Yesterday I heard a crazy rattling on the monitor during his supposed afternoon nap, and when I went in he was sitting in the crib trying to pull a wooden airplane toy through the slats. While we were playing after breakfast today he somehow grabbed a folding chair and pulled it over (onto my foot, luckily, rather than himself)--it was *feet* away from him, and I’m still not sure what he grabbed or how he did it. Lightning fast. Long reach. Big hands. Ben calls his grasp the Vulcan Death Grip because if he wants to hold onto something it’s nearly impossible to get it away. His current favorite toy is a catalogue that he’s systematically thrashing into pieces. One thing I’ve noticed is that Tuck seems to wait to do something until he can just....do it. I don’t see much experimenting, though he spent the last three weeks rocking on his hands and knees until he worked out the bunny hop to move forward. With stuff like getting into a sit from lying down he never even seemed to be interested in it, and then one day he was sitting up in the crib after his nap and now he goes from crawl to sit all the time. I have a feeling it will be the same with cruising, which so far doesn’t really interest him, though he loves to stand if we’re holding on to his hands. He’s very deliberate—we’ve noticed that he’ll focus on something and then make a sudden (successful) move, rather than working his way towards it. 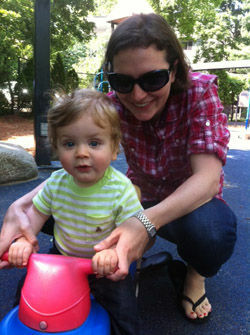 Yesterday we went to the park with my friend L and her son, who is 9 months older than Tuck. She encouraged me to let him crawl around on the ground and get dirty, and he had a great time. He also went on a ride-on car and did so well—I wouldn’t have thought he could balance but he was just fine, and held on tight while I pushed him, and even when L’s son pushed (adorable)! He’s growing up so fast...watching him actually play in the park was surreal. I have to admit I’m struggling a bit in terms of knowing what to let him try, and with avoiding comparisons with other kids. I felt guilty that I hadn’t let him try something like the car before; it never occurred to me. I assume all moms struggle with this? It’s hardest at the park because there are always other babies around the same age, and some of them seem like they are WAY ahead of Tuck, especially when it comes to crawling and cruising. I know the fact that he’s big for his age (98th percentile for height and 70th for weight) definitely slowed him down in terms of rolling and sitting. He was in the 90th percentile for weight, as well, until recently, and my friends with skinnier babies were always reporting that their kids were doing stuff weeks or months earlier than Tuck. Meanwhile the big babies seemed to be on a similar schedule to us. It’s hard to admit to this kind of thing, you know? I should just be focused on Tuck, who is a healthy, happy, sweet little boy, but somehow whenever I go to the park I come away feeling like I’ve failed him or let him down in some way. And of course when you say something like “I feel like a bad mother” everyone rolls their eyes and thinks it’s a sympathy play. I think I’m just really run down. All the travel, the huge increase in vigilance and activity during our days now that he’s all over the place, plus a persistent sore throat—I’m more exhausted and discouraged than I have been since he was really little. I’m also down because one of my closest mom-friends moved away a couple weeks ago, which has left a big void in my weeks. It’s just a bit of a tough time. Ok, that was a downer, sorry. One thing that we are loving this week: The fine Danish folk who make the PlayTray for the Tripp Trapp sent me a tray to test out with the highchair. Amazing. I love the Tripp Trapp philosophy of having a tray-free chair that pulls up to the family table, and we will definitely do that as soon as we are able. At the moment, though, our little lounger is really fond of pushing his feet against the table and moving the chair back until he can’t reach his food anymore. It was making meals really frustrating for everyone, and until he stops doing it we need a tray (with edges) that attaches to the chair. The PlayTray is perfect. It’s designed to fit the Tripp Trapp, and it just pops over the top (no attachments or anything). It’s made of thick, translucent plastic, and Tuck thinks it’s hilarious to put his toes against it from underneath, or for us to wiggle a hand under it. The tray is nice and deep, with a thick lip that keeps food from getting pushed over the edge. Basically perfect. It’s available on Amazon, too! Also--and this is a complete non-sequitor--I don’t think I ever mentioned my favorite toy tether: the Secure-a-toy. I picked up a couple packs at a local toy store a few months ago and I keep one on each stroller and one on the car seat. They are clever because the snaps are strung along at different points, so you can wrap it around a narrow toy like Sophie the Giraffe, or loop it through something with a hole, or make it longer/shorter depending on the circumstances. $4 for two. Super useful. Have a good week, everyone, and I’ll try to perk up!